Safety D.J. 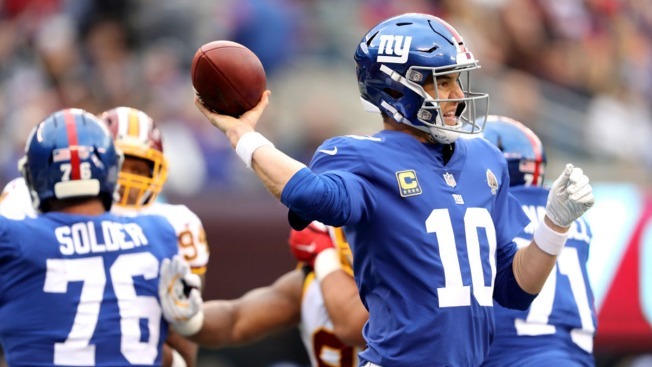 Swearinger intercepted two passes, Matt Ioannidis had 2½ sacks, and the NFC East-leading Washington Redskins rode their defense to a third straight win, a 20-13 decision over the offensively inept New York Giants on Sunday. Rosas kicked a 37-yard field goal on the second drive after passes of 11 yards to Beckham and 24 to Saquon Barkley, who was limited to 38 yards rushing, got New York in scoring position. Redskins: T Trent Williams (thumb), RB Kapri Bibbs (shoulder), S Troy Apke (hamstring) and LB Ryan Anderson (knee) were hurt during the game. The extent of their injuries was not announced. Giants RT Chad Wheeler left in the second half with an ankle injury and was replaced by Brian Mihalik.